Back in 2011, the Bank of England (the U.K.'s central bank) released a paper titled The United Kingdom's quantitative easing policy; design operation and impact. 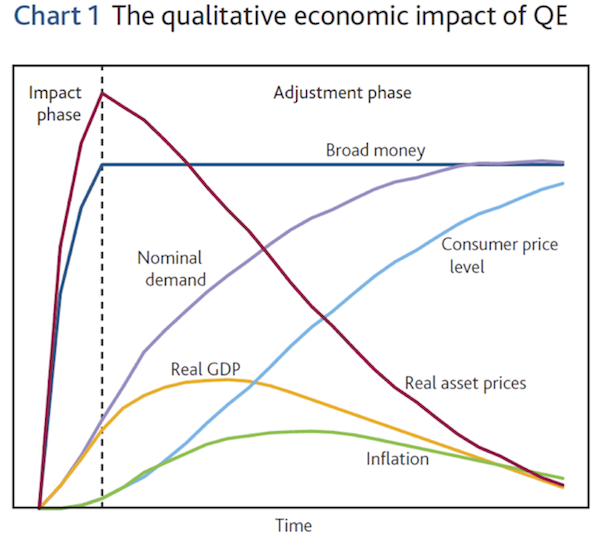 In that paper they included a chart titled "The qualitative impact of QE," which you can see below. This chart has turned out to be an accurate forecast of the impact phase (left area of the vertical dotted line), which is where we still find ourselves today. This is the phase where QE is still being administered (the heroin is still being injected). The impact phase shows the huge increase in the monetary base (broad money) due to the printed money injected into the system by central banks and the simultaneous explosion higher in asset prices due to the euphoria that the heroin injection creates. During this phase there has been a small nominal rise in demand and real GDP, while inflation and consumer price increases have remained mostly dormant. If the Federal Reserve continues their tapering process at $10 billion per meeting, they will have ended the current QE program this fall. Their next step would be to begin raising interest rates, and the final step would be to remove the excess liquidity from the system (shrink their balance sheet by selling bonds). I don't believe the Fed will get even remotely close to the completion of that last step. To understand why see: Why The Fed Can Never Exit. The conclusion of the Fed's current QE program in the fall (if we even get there before they reverse course) would bring us to the adjustment phase in the graph above. The goal is to have nominal demand continue to rise while carrying real GDP and consumer prices higher. This would be the hand off from the asset price boom to the real economy. While this hypothetical hand off would be great for certain areas of the economy it would come at a cost to real asset prices, which would collapse back down toward earth. To think that the explosion of asset prices from their current ridiculous levels (see stocks, bonds, and certain sectors of real estate in the U.S.) will not have a far greater impact on real demand seems like a bit of a stretch. This example looks at the United States and their central bank within a vacuum. In reality you must anticipate the future moves of the Bank of England (most likely to follow a similar path as the United States), Bank of Japan (most likely to increase QE), European Central Bank (most likely to increase QE) and the People's Bank of China (god only knows how they will react to their credit bubble bursting). Each one of these paths could change at a moment's notice due to a change within that country. For example, it is not difficult to see that there is a massive real estate bubble in the city of London. If that were to burst, it could create problems for the Bank of England's current plans. Capital moves freely across borders so a trillion printed by the Bank of Japan and a trillion printed by the Fed can be seen as a 2 trillion addition to global liquidity washing around the planet. This is why the Fed's taper has an impact on real estate developers in Brazil. It is also why the chart above cannot be looked at as simply as "impact" followed by "adjustment." It has been a non stop blast of QE liquidity from every major central bank around the world since the fall of 2008 (other than the European Central Bank which has been reducing the size of its balance sheet modestly since 2012). As some of these banks try to reduce and then turn off the heroin injections (move into the adjustment phase), looked for seismic dislocations to appear within the financial system. Clear and concise analysis, thanks Tuna. And I think you meant "heroin". Tuna, can a Gold/Precious Metals line be added to the above chart? Although the path is impossible to forecast, my guess would be that gold and silver would track alongside the consumer price light blue line above should inflation begin to pick up steam. They would "catch up" to all the printing around the world that has taken place from 2011 to 2014 as their nominal prices have declined.